The Most Eminent Highness, the Cardinal visited New Zealand including my town Auckland in 1975. During the German occupation of Hungary in WWII, József Mindszenty was bishop of Veszprém. The bishop's patriotism, his never changing attitude to serve God, his church and the Hungarian people put him in direct conflict with the occupying forces and the day's government. He served several months in prison. In 1945 he became archbishop of Esztergom and Catholic Primate of Hungary. In 1946 he was made Cardinal. The ruling communists embarked on confiscating the Catholic Church's - and other Churches' as well - lands, schools, most high schools and other properties. They started with the land confiscation in 1945, and the schools in 1948. In 1948, József Cardinal Mindszenty, who was a staunch, outspoken opponent of the confiscations and communism was arrested, on treason and other 'drummed up charges', but mainly for his objections to the confiscations and for his outspokenness. During his years in prison he was tortured regularly. Before József Cardinal Mindszenty's trial all schools and most high schools were confiscated. The ultimate goal was to suppress all religious activity completely and to eradicate the Churches within a foreseeable future by administrative measures and intimidation. They sought to keep the young away from the Churches and from religious instruction and activity. Teachers were forbidden to attend church services. In 1955, because of his ill health József Cardinal Mindszenty was released from prison and kept under house arrest near Rétság. During the 1956 Hungarian Revolution, József Cardinal Mindszenty was released by the village people (30-10-56). At last the much loved, respected and revered Cardinal of Hungary was free. Ever so briefly. After 4 November 1956, when the invading Soviets brutally crushed the popular uprising, József Cardinal Mindszenty took refuge in the U.S. legation in Budapest. The following years, the fact that he did not leave the country caused serious problems for the Communists. Under constant pressure from the communist government, József Cardinal Mindszenty refused to leave Hungary unless the Hungarian government rescinded his conviction and sentence. In 1964, the Hungarian state and the Vatican signed a concordat, which most of the laity resented. In effect, it covered only the appointment of bishops to fill vacancies with the addition that the state had the right to veto any appointee. In response to the Church's unwillingness to compromise, the state, as usual, took massive legal action against Catholic priests and laity in 1965. The last of the big trials took place in 1971-1972, as part of the effort to influence the Pope to persuade Cardinal Mindszenty to resign from his position as Archbishop of Esztergom-the seat of the head of the Hungarian Catholic Church. Usually priests and laymen who played an active role in Catholic communities and organised youth groups were indicted. The charge was serious: generally, they were prosecuted for conspiracy against the state. In 1971, after an agreement between the Vatican and the Hungarian government, József Cardinal Mindszenty left Hungary for the Vatican on September 29, 1971. The Pope received him with great honour and assured him: "You are and remain Archbishop of Esztergom and primate of Hungary. Continue working, and if you have difficulties, always turn trustfully to us." Later József Cardinal Mindszenty set up office in Vienna. József Cardinal Mindszenty asked the Holy See to make it possible for him to care for Hungarian Catholics in foreign countries and to appoint suffragan bishops for them. His requests were not granted. After settling in Vienna, Cardinal Mindszenty had to endure another humiliation when, on February 5, 1974, in an effort to improve church relations with Hungary, Pope Paul VI removed him as primate of Hungary and announced his removal from the See of Esztergom. (It was here that Prince Géza established the royal seat. Subsequently his son Stephen chose it as the site of Hungary's first cathedral. His coronation by a papal envoy on Christmas Day 1000 AD signified the country's recognition by Christendom. József Cardinal Mindszenty's office announced: the Cardinal has not abdicated his office as Archbishop nor his dignity as primate of Hungary. The decision was taken by the Holy See alone. The first issue Kontinent printed three pictures on the cover with three quotations. The pictures are those of Alexander Solzhenitsyn, Milovan Djilas, and József Cardinal Mindszenty. The following quotation accompanies the Cardinal's picture: "The Church does not ask to be defended by secular powers because its refuge is under the wings of God. The picture over the altar in the church of Papa represents the stoning of St. Stephen. I pointed to this picture and appealed to the Hungarians not to stone each other, but imitate the virtue of this protomartyr of the Holy Church." Cardinal Mindszenty died in Vienna on May 6, 1975. R.I.P. (This account does not intend to be a precise account of the late Prince-Primate József Mindszenty, Archbishop of Esztergom, Cardinal of Hungary. In 1975 the late Cardinal Mindszenty visited the Hungarians in New Zealand, including my home town Auckland. Here I have some photos of the Cardinal's visit to Auckland and also my confession, which is closely related to His Most Eminent Highness' Auckland visit. 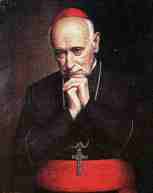 I admire, respect and revere the late Prince-Primate József Mindszenty, Archbishop of Esztergom, Cardinal of Hungary. The Prince-Primate made numerous visits to Hungarians settled overseas. Before his death the late Prince-Primate visited New Zealand. In Auckland I was fortunate enough to be the 'official photographer' at his arrival. Some time later at a public meeting he urged us to be faithful to our Hungarian heritage, maintain our patriotism and keep our language alive. Teach our children our language. (This one specially struck a cord with me at the time. For one, I was married to an English woman, our communication was through English only, although she would probably was willing to learn my language, however useless it seems here in New Zealand, if had I only went to the extra trouble to teach her. We also had a daughter, who was 13 years old at the time and only knew a very few words of Hungarian. Since than I married again, my son is 15 years old now, my wife a is Singaporean Chinese, the same story again. Secondly Hungary suffered great humiliation after WWI at the Trianon Peace Agreement. When Hungary lost 2/3rd of the 1000 year old kingdom/country. At the meeting the Prince-Primate asked for volunteers, one from the north, east, south and west part of Auckland, to be the 'trustees' to set up a school to teach our kids our language. I was one of the volunteers, the one from the west. We started and I kept the school going for a few months. In the end I ended up as the teacher. At the second 'class' three of us 'trustees' turned up. At the third and the other following ones, I was the only one. About five years later, my conscience feeling guilty, at my own cost I bought some books from overseas, I talked a retired teacher into to teach a class at a cut rate. We persevered for about a year. We had about 10 students at the start. A few months later, there was only three left, including me.None of the other three 'trustees would have anything to do with the school anymore. They would have nothing to do with the school anymore and wouldn't even give me moral support. The following year I re-started the school again, this time I was the teacher. Again I kept going till the end of the school year. this time we had 15 to start and 6 finishing, this time not including myself. Due to lack of interest, I could not start the class the following year. About 5 years later I enrolled and qualified as a 'Second Language Teacher' at the Auckland University of Technology. Due to general apathy, lack of interest in the Hungarian language in Auckland, at present I do not know of any Hungarian Language class/es. Right now and all through the previous years I felt guilty for not doing more for preserving my heritage and language. The truth is that even my son (15) only knows a few words of Hungarian. I feel I let Prince-Primate József Mindszenty and my heritage down. I was very glad to see, that there are many 'Cardinal Mindszenty' clubs, organisations functioning in the U.S.A. I sincerely hope and wish, that they do not run up against the apathy, prevalent here in Auckland, New Zealand. You should not feel so guilty. I am an American of half-Hungarian ancestry and I am just beginning to learn my mother's first language at the age of fifty. I was fortunate enough to be able to take my mother to Hungary in 1997. We were able to pray to Cardinal Mindszenty at his tomb in the Esztergom Cathedral. It was one of the high points of my life. He has always been a hero and saint to me ever since I was a child. I was also able to hear him speak (although my mother had to translate at the time) and attend one of his Masses here in the United States in the early 1970's. I always pray for his canonization, which I believe will come. I think what you describe about Hungarians "losing" their heritage is true, but I also think that it illustrates what makes Hungarians successful wherever they go. I think that they throw themselves with enthusiasm into whichever culture they find themselves. They are also not "clannish." They are very open and accepting to all kinds of people. In my family, none of the Hungarians married other Hungarians. They get along with everyone. God bless you for your devotion to the Cardinal and to your heritage! Isten áldd meg a magyart! - Documentation for the process of beatification of Cardinal József Mindszenty, who died in Vienna in 1975, has been presented to the Congregation for the Causes of Saints by the postulator, Fr. János Szõke. The cardinal was born in Mindszent, Hungary, in 1892, was ordained a priest in 1915 and a bishop in 1944. Raised to the Primacy of Hungary in 1945, he was created a cardinal the following year. He was arrested in 1948 by the communist regime and imprisoned in 1949. During several days of freedom given to him in 1956, he sought refuge in the U.S. Embassy in Budapest, where he remained until 1971, when he was permitted to leave the country. Links to other pages/sites on the web regarding Joseph Cardinal Mindszenty. a. I may not necessarily agree with or endorse all the views, statements or aims stated on these site/s. The Cardinal Mindszenty Foundation. "To Build and defend the Catholic Faith To Strengthen and sustain family life To work for freedom for all under God"
Here I have some photos of the Cardinal's visit to Auckland in 1975.